About me - finesouthernhomesonlines jimdo page! Favourite quotes: "Therefore everyone who hears these words of mine and puts them into practice is like a wise man who built his house on a rock. The rain came down, the streams rose, and the winds blew and beat against that house; yet it did not fall, because it had its foundation on the rock." I have been involved in the construction industry off and on since 1975 building my first homes on St. Simons Island off the Georgia coast. In order to improve the quality of construction I have continued to study to achieve additional licenses and certifications. I have been ICC certified as a Residental General Contractor and Residental Building Inspector. I am also a graduate of Building Specs Inc for Home Inspections. When Georgia began licensing their general contractors they grandfathered them into the system based on experience. I went a step further and passed the certification exams administered by the International Code Congress. I take pride in working with clients. My goal is to always build a quality home at a fair price. My wife teams with me as we strive to exceed our customer's expectations. We try to become personal friends with all who we've built a custom home. We use our experience in building fine southern homes in helping our customers find the right floor plans that suit their desires. 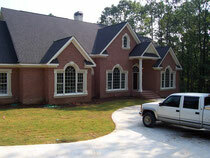 We have access to available lots and house plans. If the perfect plan is not available we partner with architects who assist in refining your plans or drawing new plans from scratch. Our expertise assist you in obtaining all the features you desire in a new home and we also offer suggestions and ideas that we have experienced over the years. We assist our clients in all stages of the construction project. I share with each customer a multi-page sreadsheet showing the cost of construction based on their specs for their specific home. We are proud of our cost estimates and control during construction so that customers are not surprised at the end with a home over budget. The 18 plus pages of this spreadsheet show every board (not nails) that goes into the home and the varibles of cost depending on the home owners desires and finances.